The best way to get to know Joburg is to hang out with an insider. In our Ask a Local series we chat to some of our favourite Joburg city people to get the lowdown on what makes Joburg unique. 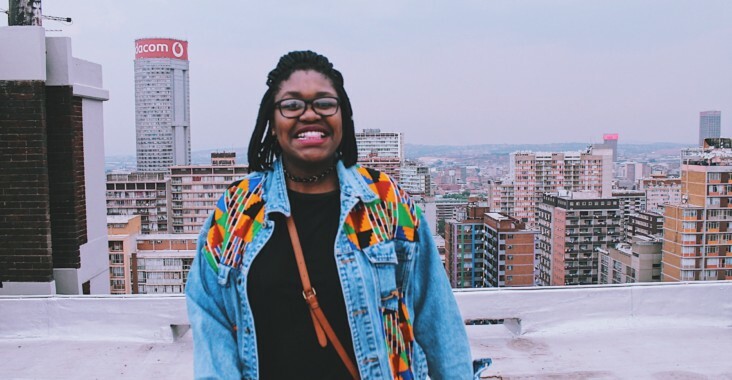 This week Dudu Luthuli gives us her take on the city. DUDU LUTHULI is a copywriter and lover of good stories. She describes herself as a curious young woman who seeks beauty wherever she goes. Follow Dudu online on Instagram @dudu_luthuli and on her blog seethecityjhb.wordpress.com. I’m a Jozi native (how lucky?). I lived in Cape Town for a few years but decided to come back home to experience the city as a fully-fledged adult and I am loving it. That it’s possible to call it home. Because of the fact that many people in Joburg are from everywhere else, the concept of permanence, and of growing roots in this city is a strange concept for many. But that’s exactly what this city is for me – home. Melville for sure. I love that no house looks the same as each has its unique character, making it such a delight to walk down its avenues. There’s also the added bonus of the cafes and restaurants and bookstores you find there. What a gem. I have so many favourites based on my mood, but for now I’ll say The Whippet in Linden. Their “Grown up grilled cheese” sandwich is something I believe every human in the world should try. It’s that good. The Orbit is my second home. Nothing helps me unwind more than live music played by some of the country’s finest musicians. Joburg CBD thrift stalls. I’m always on the hunt for affordable yet good quality clothes, and the CBD helps me out with that. I also love the fact that you can negotiate prices and score freebies if you treat traders with respect (also helps if you’re a regular). That’s something you hardly get at a mall. Moyo Zoo Lake. It has everything I enjoy. Good music, delicious cocktails (and great food specials), beautiful views, and good service. 1. A jazz-filled evening at The Orbit is unmissable. 2. Rooftop Salsa in Jeppestown/Maboneng (on Auret Street) is such fun. 3. City Sightseeing bus tour because it offers a simple way to get an overview of a particular area in the city. I don’t have a favourite spot, but I do enjoy the vibe that The Zone@Rosebank and Keyes Art Mile offer. Very cosmopolitan. Give this city a chance. Take precautionary measures as you would in any other city but open up to Joburg and it’ll return the favour – to which you’ll be pleasantly surprised at what it shows you. On weekends you’ll find me …. taking part in a walking tour. You can also find me putting my salsa moves to the test or enjoying some braai’d meat at Bafokeng Corner in Phiri, Soweto. I love that it’s a city for anyone. No matter shape or colour, Jozi makes it possible for anyone to make the most of what it has to offer. The devastating effects of apartheid-enforced spatial planning. Moving around the city, especially when you don’t have a car, is a mission and a half that often costs so much time and money. It would definitely be a place like Amsterdam or London, and that’s purely because of the great public transport systems they’ve developed. I think cities that have it in their design to facilitate movement is important, as mobility means better access to goods and services for all. If Joburg could get that right, well, this question wouldn’t have an answer ☺ . Three words that describe this city …. Beautiful. Unpretentious. Exhilarating.